How does our colonial past echo through today’s global politics? How have former empire-builders sought vindication or atonement, and formerly colonized states reversal or retribution? This groundbreaking book presents a panoramic view of attitudes to empires past and present, seen not only through the hard politics of international power structures but also through the nuances of memory, historiography and national and minority cultural identities. Bringing together leading historians, political scientists and international relations scholars from across the globe, Echoes of Empire emphasizes Europe’s colonial legacy whilst also highlighting the importance of non-European power centres – Ottoman, Russian, Chinese, Japanese – in shaping world politics, then and now. Echoes of Empire bridges the divide between disciplines to trace the global routes travelled by objects, ideas and people and forms a radically different notion of the term ‘empire’ itself. This will be an essential companion to courses on international relations and imperial history as well as a fascinating read for anyone interested in Western hegemony, North- South relations, global power shifts and the longue durée. Echoes of Empire: The Present of the Past; Kalypso Nicolaïdis, Berny Sèbe and Gabrielle Maas | Part 1: Colonialism and Modernity: Views from the Receiving End | Imperial Parasitism: British Explorers and Africa’s Empires; Dane Kennedy | Colonial Modernities: A View from the Imperial Verandah, c. 1880–1960; Jan-Georg Deutsch | Fading Echoes: Legacy of Empire and Democracy in India; Sarmila Bose | The Imperial Question in the History of Ibero-America:The Importance of the Long View; Jean-Frédéric Schaub | Epilogue: The History, Identity and Crisis and Endemic Submission of the American Continent; Juan José Rossi | Part II: Return to Sender? 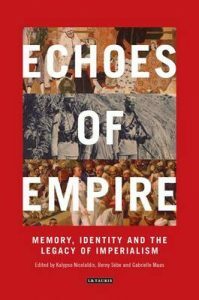 Imperial Visions, Imperial Legacies | The Echoes of Rome in British and American Hegemonic Ideology; Ali Parchami | Towards Cosmopolitan Perspectives on Empires and their Echoes? The Case for a European Framework; Berny Sèbe | Between Memory, History, and Historiography: Contesting Ottoman Legacies in Turkey, 1923–2012; Nora Fisher Onar | The Russian Empire and the Soviet Union: Too Soon to Talk of Echoes? ; Alexander Morrison | State of Insecurity: Self-Defence and Self-Cultivation in the Genesis of Japanese Imperialism; Christopher Harding | Epilogue: Analysing ‘Echoes of Empire’ in Contemporary Context: The Personal Odyssey of an Imperial Historian (1970s – present); John MacKenzie | Part III: From Imperial to Normative Power: the EU Project in a post-Colonial World | Building Eurafrica: Reviving Colonialism through European Integration 1920–60; Peo Hansen & Stefan Jonsson | Echoes of Colonialism in Trade Negotiations between the European Union and African, Caribbean and Pacific Countries; Emily Jones & Clara Weinhardt | From the Soviet Bloc to the New Middle Age: East-Central Europe’s Three Imperial Moments; Dimitar Bechev | The EU and its Eastern Neighbours: Why ‘Othering’ Matters; Elena Korosteleva | ‘Southern Barbarians’? A Postcolonial Critique of EUniversalism; Kalypso Nicolaïdis | Epilogue: Chinese Empire meets the West: A Centennial Conundrum for China; Zhu Liqun & Feng Jicheng | Part IV: Globalism: From the Colonial to the Postcolonial Worlds | European Power and the Mapping of Global Order; Karoline Postel-Vinay | Legal Child vs Step Child? The Impact of Colonial Legacies on Brazil’s and India’s Global Trajectories; Vinícius Rodrigues Vieira | Echoes of Imperialism in LGBT Activism; Rahul Rao | From Anti-Colonial Movements to the New Social Movements; Robert J.C.Young | Colonization and Globalization; Jacques Frémeaux & Gabrielle Maas | Epilogue: After- Images of Empire; Bernard Porter | Afterword; John Darwin.